Crepes have been one of my favorite breakfasts for a long time. I love the diversity you can have creating a crepe. Sweet… Savory… whatever you are in the mood for! Where I live, we have a simple and quaint crepe cafe. It is delightful. I thought I knew what a good crepe was until I tried out this place. The little cafe broadened my horizon on endless possibilities. I have actually made a couple copy cat versions of their incredible crepes, but first things first… I had to find the perfect crepe base recipe first. I have searched quite sometime for a good crepe recipe. One that wasn’t too thick but also not too thin. One whose flavor was delicious, not overbearing, but not completely bland either. And I have finally stumbled across that recipe and am so excited to share it with all of you today. 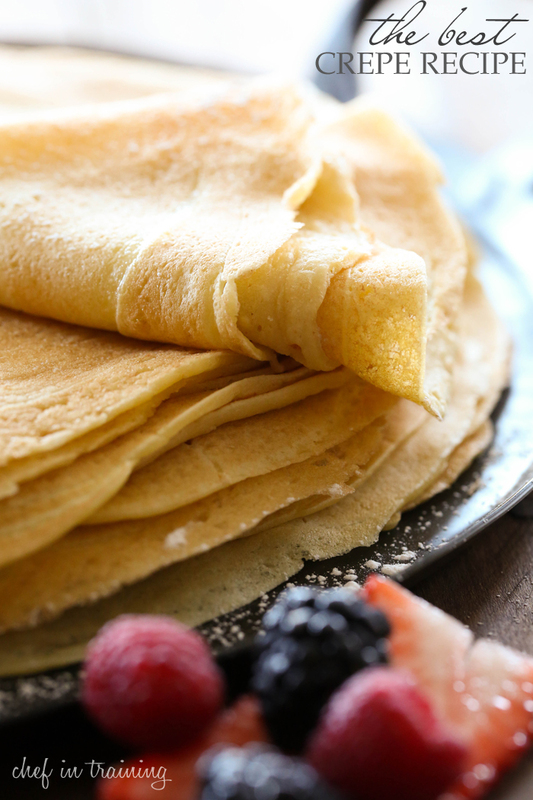 If you are looking for a simple but delicious breakfast for Valentines Day tomorrow, or really for any day or occasion, give these crepes a try! They truly are the BEST that I have tried! I have tried several recipes looking for the perfect flavor and batter for crepes and have finally found it! This recipe is awesome! 4 teaspoons sugar if you are making dessert crepes, don't add if they are for savory crepes. In a large mixing bowl, whisk flour and eggs. Slowly add milk and water stirring until smooth. (I use my immersion hand blender.) Add salt and butter (and sugar if making dessert crepes) and continue beating until smooth. Heat and oil pan to medium high temperature. Pour about ¼ cup of batter into pan and tilt the pan to swirl in a circular motion so that the batter coats the surface evenly. I have a crepe maker that also works great and is super simple to use. Either will work. Serve hot and Fill or top however you desire. Thanks for sharing!!!! Looks easy! Does it matter what kind of milk you use? We have lactose free milk and wasn't sure if I should use something heavier. Looks supiciously like the recipe I have been using for almost 50 year's. Will find that recipe and compare. using a lactose free milk should have no negative effect on the crepe, it is no less creamy than regular milk only the milk sugars have been removed, not the cream. most crepes are best if whole milk is used rather than 2 % or fat free. just purchase regular lactose free milk. it can be used in any recipe that uses regular whole milk. owned and operated SilverSpoons catering for 30+ years. Not rating recipe at this time. I agree with Averie, and your timing is perfect, i was just saying I needed to figure out how to make crepes! What size skillet do you use for 1/4 cup of batter? Do NOT ever add sugar into your crepe mixture. Crepes will stick to the pan and ruin them. Just salt. Mineral water (carbonated) is better than just water. I just made them and added a little powdered sugar and didn't have any sticking problem! Not true. We make crepes every weekend, always add sugar to the mixture, have cooked them in every kind of pan we've got (stainless steel, cast iron, ceramic...) and not once has any surface ever gotten ruined. You must not be brushing the surface of your pans lightly with butter, as you are supposed to. I absolutely do not recommend anyone adding oil to any crepe recipe. Not too sure about the carbonated water recommendation either. Some reviews and suggestions such as this should be disregarded! I use a baking sugar when doing my crepes due to the fine grain of it. Never had an issue with sticking. Coconut oil spray for the pan. I also use my blender to blend. Then let batter rest for 30min to an hr. Perfect every time. How many crepes does this recipe make? I just doubled it for a family party tonight. I have a Tibos crepe pan from France. It's very nice and comes with all the tools to make beautiful crepes. It's not a cheap pan but works VERY well. I'm sorry if you already explained-what size and type pan do you use for making your crepes? my mom used to use a small one, if I remember correctly, but creperies use those gigantic ones! I made this recipe over the weekend. They turned out to be good. I did have to alter it tho. When I followed the recipe the batter was very thick. So I did have to add some extra milk and water. I did use the sugar and my crepes did not stick. I used a little coconut oil in my pan and only as often as I thought needed to keep them from sticking, which was not much at all. I also tried these with a gluten free flour. The next time I make them I will start out with 1 cup flour and add more as needed. I have a question about the flour used in making the best crepe recipe. There are so many times I see recipes but no one ever tells what type of four to use. In England, we used either regular flour or for cakes, etc., we were told to use self raising flour. Now, over here we have regular flour (robin hood) or we have cake and pastry flour (monarch) but we also have self raising flour (brodie). Which kind of flour is used to make the crepes?? I have written down the recipe and all I need to know is which type of flour because these look like what my Mom used to make!! Is the milk and water at room temperature, heated or boiled? Crepes don't need any sugar in the batter and four eggs are too many. Two tbsp of oil or melted butter and two eggs is better. Also, you can replace the water with more milk and they'll come out much better. If ÿou are paying any attention whatsoever, this recipe is basically doubled with two cups of flour. So, yes, the additional eggs and butter are necessary. But you go ahead and use the two cups of flour and only two eggs....yuck! when I make my crepes, it's usually for delicious sea food ones! With shrimp, scallops, white fish... a light alfredo sauce with mushrooms and scallions... I ALWAYS add chopped dill to the batter. gives a delightful flavor! I haven't tried your crepe recipe, YET but I do love crepes so I plan to give them a try. HOWEVER, I did just wish to say one thing: IF you feel the necessity to be rude in your comments, please keep it to yourself! It's okay to comment on ways you like crepes or things you might want to add or change, but beyond that... it's just plain rude! My mother used to say, "If you can't say something nice, keep it to yourself"! The best crepes I have ever made.And so simple.My search is over.Thank you! I don't understand why all you people with "changes" to this recipe don't just get you own food blog. Some of you change the ingredients so much that the recipe is no longer the same and should be called an entirely different thing. This blog belongs to the person who writes it. Can't you just take HER recipes posted as what they are and stop changing the ingredients. I would never go into someone's house for dinner and tell them what they should add or not add to the dish I was just served. (i.e. "don't add sugar, they'll stick" or "4 eggs are too many". I couldn't find the recipe I used last week so I decided to try this one. Unfortunately I did not have success with this recipe. The batter ended up way too thick and lumpy. I had to add a lot of extra milk to thin it out. I rarely cook anything but had no problem with this receipe which ive now made at least half a dozen times. The thickness is perfect everytime. Yours must have been too thin because your flour was clumped which would be related to your mixing technique. Check youtube for that and your next batch should turn out great! Good luck? Do you scoop your flour or spoon it into your measuring cup? We could each measure 1 cup of flour, and depending how we did it , it could weigh differently. I suspect you used more flour, without realizing it. I recomend stiring flour with a fork, right in the bag, spoon flour into measuring cup, do not tap, use a knife to level. I think you will have more success if you take the time to measre flour this way! This was an amazing recipe! I am by no means a good chef, but these turned out like a masterpiece. They both looked and tasted great. I would definitely recommend this recipe and I would definitely make it again! I just made these for dinner last night and it came out absolutely perfect. The few nonsensical commenters who only criticised and failed are probably dunces anyway to mess up your flawless recipe. I plan on using my leftover batter for mille crepes tonight. Keep on keeping on! I'm not a very experienced cook. 1, could you use fat free milk, and 2. Is this self rising flour' or plain flour ? I just tried this recipe using almond milk and the crepes turned out really good! I used almond milk and it came out delicious. Also, I put a thin layer of Nutella and rolled it up. How many crepes does this make? I'm now addicted to these crepes. I've been making them every Saturday morning for the last month. They are delicious! Thank you so much!!! There\se REALLY are the best crepes! I have made a lot and searched for a good recipe, this is it!!! Thank you!!! And I should add that I used Whole Wheat Pastry flour. Perfect! How many crepes does this recipe make using the 1/4 c for each? I add a medium size potato, mashed. It makes it light and fluffy. I am plant based and love crepes....these are the best crepes....ever!!!!!!! I substituted egg replacer for eggs and used a plant base milk. My family wants these on the menu once a week. They are super easy too. Nikki, I'd love to have suggestions of items you have used to fill crepes with. I'm a novice when it comes to crepes. I can bake any cake but crepes are a mystery. Any would help me, sweet or savory. I love the way crepes look and can be made to be pretty. I made crepes for the first time using this recipe. I usually alter my recipes and not on purpose I just tend not to measure. All comments should be about this recipe because I agree with everyone else when you alter it too much it's not the same recipe. Besides it clearly says chef in training so anyone changing this is clearly not in training. I loved this recipe sooo much that I keep using it and will properly measure so that I don't have clumpy crepes that stick. End of rant... THANK YOU !!!! Have made crepes with many different recipes but for some reason could not get these crepes to cook right. They would fall apart even before they were ready to be flipped & looked very chunky once they started cooking. Tried several times before giving up & throwing the batter away. The batter is quite thick I find, I add a lot more milk, maybe even 2 cups more and it's nice and thin and easier to work with that way :) Yum! thanks for the recipe! How many crepes does this recipe make? HI. Great crepe recipe. Can you freeze them. just learned how to make crepes for my children. This recipe is Flawless! After several faliled attempts using other recipes, I was able to make perfect crepes! My daughter loves crepes and I have been buying the expensive packaged ones at the store. I plan to make your recipe but want to know how long these can stay in the refrigerator or if they can be frozen, as she eats only one for breakfasr. I look forward to making your recipe and await your response. This recipe was very good. I didn't have enough whole milk, so I had use 1/4 cup 2% and I also used 6 small eggs instead of 4 regular ones. I used 1/4 cup of batter for each one and it made 16 crepes. When I was a little girl in France we would eat "crepes" once a week . My Grand'mother would add fresh yeast and let the mixture rest before making the crepes. They came out a little thicker and the yeast added a delicate taste that I liked. We just served them with a sprinkle of sugar and rolled them . On special occasions she would spread her homemade red currant jelly...Yum! I tried your crepe recipe today. It was awesome. I use another recipe almost comparable, but decided to try yours. It was a hit. First time, I have ever put sugar in a crepe. Always wondered how to sweeten them. Sounds dumb, but true. Thank you for creating such an amazing site. I just found my love of cooking a few years ago. I went from serving raw fish to homemade manicotti, bread, creme Brielle, etc. Now I plan to use your site to try new recipes. Keep up the great work. I know you probably put a lot of time and energy into this site. Just know you are very appreciated by us newbie cooks. I grew up eating crepes but had never tried making them myself because I was a little nervous about how to cook them. After 17 years of marriage and 2 kids later, I finally decided to try making them and used this recipe! It was perfect. They were super easy to make and tasted delicious! They fed my family of 4 perfectly. I didn't change a thing - except that I threw all the ingredients into my vitamix and mixed it that way. We all thought they turned out wonderfully. Also, I used my small frying pan and 1% milk. I've made them several times now and I'm making them again for dinner tonight. Thanks for a great, yummy, easy recipe. The crepes themselves turned out decent, but the batter was very lumpy. I think initially whisking only the eggs and flour is what started it. I've made crepes several times before and haven't had this problem. Any suggestions? What is the best temperature for doing the crepe? I have never made a crepe in my life, seen this recipe last night and made them today. WOW, the recipe is spot on and very easy to do. Turned out absolutely great, everyone in the fam was snatching them off the plate as fast as I could make them. Thank you so much, how can something so simple be so good. First time I ever made crepes I used this recipe, and was praised by my boyfriend who happens to be a better cook than me. Definitely recommend! My Grandson and I made these this morning for breakfast following the recipe exactly except we halved it. We filled them with strawberries and whipped cream. Most delicious! Thank-you. Hi there, I've never made a crepe before (pancakes yes) but avoided this, thinking it was difficult. I plucked up the courage gave it a go; made a batch for a function at my church luncheon today; it went down a treat, simple filling of apple and cream, the whole dish worked a treat. Thank you for sharing this. And easy and straightforward recipe. Great crepe recipe!! Thanks so much for sharing. I made them just like the recipe and they were a success. My family loved them! Awesome recipe. Thank you! These are truly the best crepes I have ever made. Made the recipe three times, once with almond milk and all turned out delicious! I have used this recipe to make multiple crepe cakes, and they turned out lovely! This Is the best crepe recipe ever!!! Excellent recipe, came out great. I made one with homemade berry jam and another with banana and Nutella filling. Delish, thanks for sharing. This is my go to recipe for crepes. I throw all ingredients into the bowl then stir. Do not mix eggs and flour first. It will get very lumpy. I also use lactose free milk and it still tastes great! This really is the best crepe recipe! Thanks for sharing, I make them all the time! How many crepes could be made in your recipe of 2 cups flour and 4 eggs? I made these this morning and they were wonderful. I'll be making these again. My stepson was visiting and mentioned that crepes are his favorite food. This recipe seemed to be the most do-able, so I whipped up a batch and filled them with cookie butter. They were A-MAY-ZING & he said they were the best he’s ever had. Thank you for the recipe! I believe the ratio of flower to liquid (egg/milk/butter) was off. I had similar results to another reviewer who pointed out that the batter seemed thick and would fall apart while turning over. This recipe is more like a thin pancake. The flavor profile was also more like a pancake than I like. A traditional French crepe should be able to retain its disc shape without tearing apart, and ideally should be almost translucent thin with crispy edges. Perhaps decreasing the flour or increasing the milk would solve the problem! I have very few food blogs I get recipes from and I am happy to say chef-in-training is one of my favorites. The recipes of followed exactly gives perfect results.. I have used the recipe before and the outcome was just as I love it... unfortunately I lost the recipe is why I’m back to get it. If you do not agree with this recipe, simply move on. No need commenting. I used sea salt and of course real butter and they are fabulous! Can you use this crepe recipe for manicotti. I’m not sure why we’re supposed to whisk the flour and eggs first, before any liquid is added. This created a giant mound of dough for me and the batter was clumpy through the rest of the recipe. I had to throw away and redo my own way. Fantastic recipe! First time making crepes 'ever' and they came out perfect! Thank you so much for sharing! The best recipe for lovely tasty crepes!!!! I have made this many morning's and say a mental thanks every time!!! Loved this recipe. Followed this recipe to the t and it was perfect.